With Halloween fast approaching, we’ve been searching the online fashion archives, on the hunt for some spook-tastic costume inspiration. Imagine our joy when we stumbled across filmmaker Tim Burton’s fantastical shoot for Harper’s Bazaar (2009), shot by fashion photographer Tim Walker. Featuring a host of designer labels – Chanel, Alexander McQueen, Balmain and more – this wonderfully theatrical shoot portrays the dark delights of the season – the macarbre, the spooky and the spine-tinglingly scary, whilst also delivering an undercurrent of glamour, style and sophistication. Exactly the inspiration we were looking for. 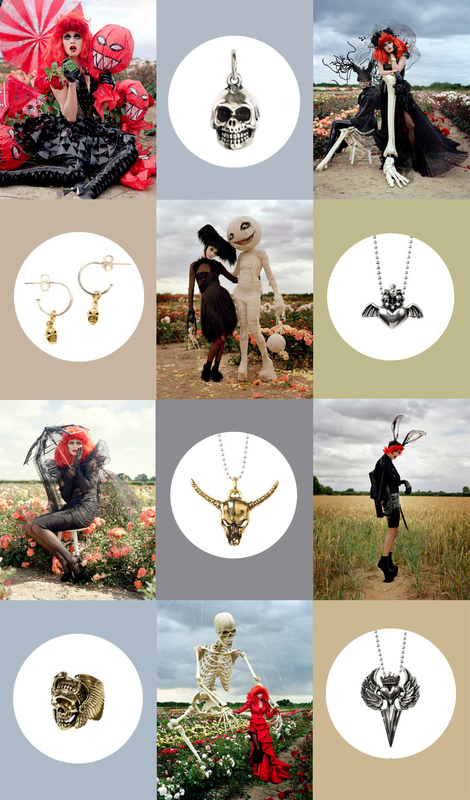 For those who’d prefer to give a more subtle nod to the 31st October, why not consider a piece of skull jewellery. Perfect for Halloween – and beyond.